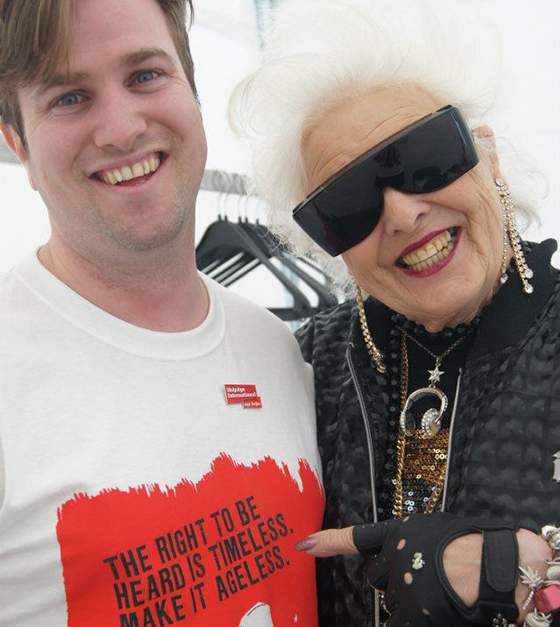 How do you engage young people with an old age campaign? This was the question for HelpAge – an international charity that fights for better rights and care for older people across the globe. They work to make sure older people live healthy, dignified lives, and receive the protection and respect they deserve. In recognition of the ‘Year of Active Ageing and Solidarity Between Generations’, HelpAge wanted to launch a campaign that raised awareness of the plight of these older people in developing countries. And that encouraged younger people in Europe to sign a petition that put their rights firmly on the agenda of the EU. Most of us know the plight of people in the developing world, but we rarely hear about the role older people play in these countries – from rebuilding communities after disasters to caring for children orphaned by HIV and Aids. These older people are an absolutely vital part of their society, but they’re often overlooked by policy makers and aid programmes – expected to contribute without any support or care themselves. On the face of it, a young person in Europe has little in common with an older person in a developing country. Our first step was to create a campaign proposition that drew a strong link between the two – a sense of injustice in not being listened to or heard. Then we developed this idea by creating a provocative, protest look and feel for the campaign – leveraging the timeless yet also timely appeal of people power. HelpAge want to challenge preconceptions about older people so we created a campaign film unlike anything you’d expect from an old charity – a hard-hitting combination of protest imagery and footage, positioning older people as actively fighting to get their voice heard. We also developed a campaign microsite where the video could sit, accompanied by a strong call to action – to ‘join the virtual march’ and sign the petition. And we rolled the campaign out offline, creating banners, posters and t-shirts for use at university events across Europe. More than 8,400 people signed up to join the virtual march. 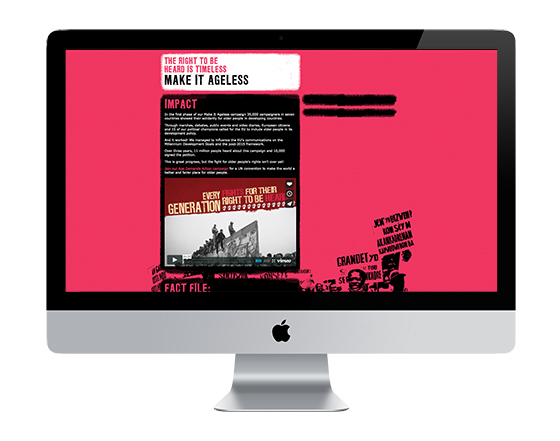 The ‘Make it Ageless’ website also attracted around 6,000 visitors per month, whilst the campaign reached over 3.3 million people through Facebook and online search. 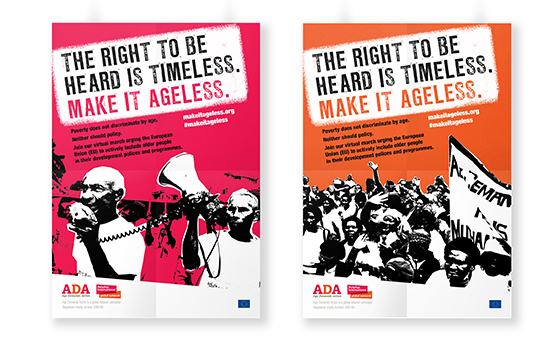 On top of this, the offline campaign made its way around key youth events in Europe – meaning older people in developing countries should start receiving much more recognition. And that their rights can start to take rightful priority in the development policy and programmes of the EU.